Warm up with this delicious soup! It makes a great family dinner and as this recipe is easy to prepare, it also makes a perfect midweek meal. To make this potato, bacon and leek soup extra special you can serve it with toasted Turkish bread which has been covered in butter – yum! 1. Roughly chop the potatoes into pieces no bigger than 4 cm and set aside until needed. 2. Also roughly chop the onion and leek and crush the garlic cloves. 3. Heat a large saucepan over a medium heat and melt the butter. 4. 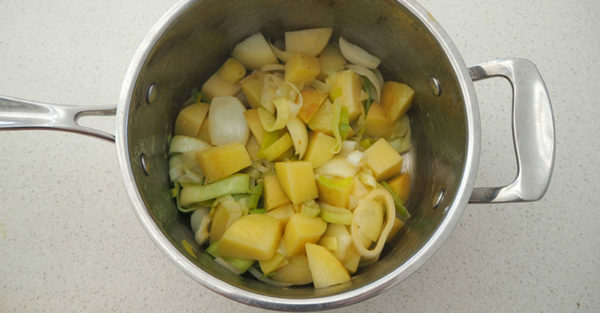 Add the chopped potatoes, onion, leek and garlic and cook for 5 minutes or until the vegetables begin to soften. 5. Add the chicken stock and milk and stir to combine. 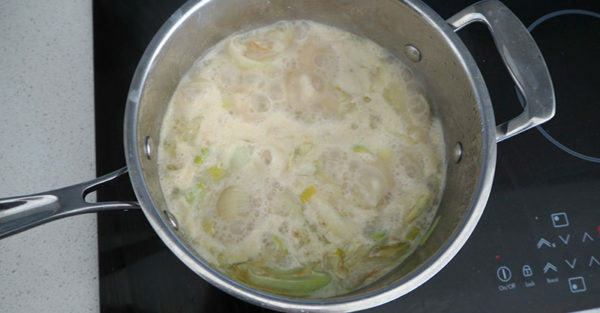 Bring the mixture to a simmer and let it cook (without the lid) for 20 – 25 minutes or until the potatoes are soft. 6. While the soup is cooking, chop the bacon into small pieces and cook in a frying pan over a medium heat until it starts to turn golden brown. Remove from the heat and set aside until needed. 7. 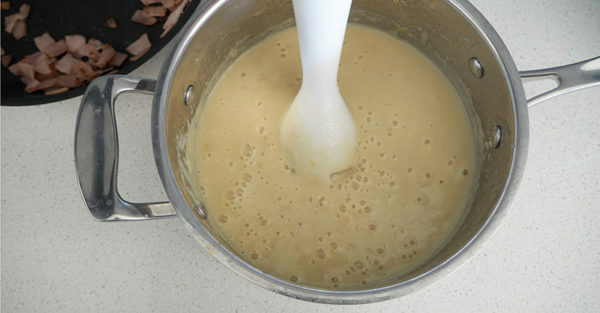 Remove the soup from the heat and let it cool for 10 minutes before adding approximately ¼ of the cooked bacon and blend with a stick mixer until a smooth consistency is achieved. 8. Divide the blended soup amongst your bowls and sprinkle with the remaining cooked bacon pieces to serve.